As Paul Healey made his way to the polls in South Boston, he found himself in the distinct minority, badly outnumbered by the runners and bikers enjoying the late summer day along the water. He saw plenty of campaign signs, many for down-ticket races, and an enthusiastic group of supporters at the entrance. Few voters entered. But for Healey, 38, and others who cast their ballots in Tuesday’s low-turnout primary, not voting was something that never crossed their mind. Despite a contested governor’s race without an incumbent and a host of downticket races, statewide turnout was listless. 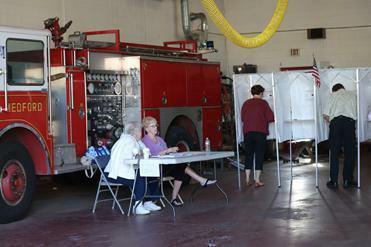 Many cities and towns expected ballots from just 15 percent of registered voters. Some voters voiced dismay at the low turnout, which they said reflected a growing lack of interest in public affairs. “I think sometimes we think the issues don’t affect us or don’t matter to us, but they do, and it’s really important to have your voice be heard,” said Elizabeth Pinto, 25, who voted in Allston. In Boston, 16.6 percent of registered voters turned out, according to city figures. According to municipal records and officials, additional turnouts included roughly 14.3 percent in Worcester, 15 percent in Brockton, 22 percent in Barnstable, 13.2 percent in Springfield, 10.8 in New Bedford, and 17.4 percent in Lynn, which featured a contested congressional race between incumbent John Tierney and Seth Moulton. William Galvin, who oversees Massachusetts elections as secretary of state, said he expected about 550,000 Democratic and 170,000 Republican ballots to be cast, a similar turnout to that of 2010, when Governor Deval Patrick ran uncontested in the Democratic primary. Turnout for that election was 17 percent. Patrick’s first run for governor, in 2006, drew a statewide turnout of more than 25 percent in the primary. But this year’s candidates have not sparked nearly as much enthusiasm, voters said. Gerry Cuddyer, who chairs the Board of Election Commissioners in Boston, said it felt as though many voters were still in summer mode. By mid-afternoon Cuddyer had sent many volunteers back to their offices. Across the region, voters said the governor’s race, particularly the Democratic contest between Martha Coakley, Steve Grossman, and Don Berwick, was their central focus. “I really only did research on the gubernatorial candidates,” said Kathleen Head, 28, who voted at the Jackson Mann K-8 school in Allston, where voters arrived in dribs and drabs. Pat Barry of Quincy, an independent voter who considers herself a Democrat, said she had a hard time making up her mind in the statewide races. “I want to boot half the people out, but I don’t know who to put in,” she said. At the John F. Kennedy School in Boston’s Jamaica Plain neighborhood, 85-year-old Catherine Gallagher said she never misses an election. And Barbara Dessesaure, 68, said she felt it was crucial to be counted. At the Curley Community Center in South Boston, several voters said they had never seen it so slow. “People are just too busy, especially since it’s just a primary,” said Mary Ahern, who was bringing her 90-year-old mother to vote. Some voters, banking on no lines, simply put their blinkers on and parked illegally along the curb. They were back in no time. In Davis Square, voters breezed through the polls at Ciampa Manor on College Avenue. By 10 a.m., there was no line to vote and nobody holding signs outside. Even the parking spaces were empty. Poll warden Elaine Cobucci said 126 voters had turned out early in the morning, typical of a primary. “It’s been steady,” she said. But in this progressive neighborhood, at a time when the state could elect a woman as governor for the first time, the turnout was far lower than in each of the past two presidential elections, when the line to vote stretched several blocks and lasted as long as two hours. John Langton, 40, the owner of a software startup in Kendall Square, lamented the lack of interest in local races. “This is where you can really effect change,” he said. Jeanette Wiltshire, 81, of Somerville, said she voted mostly for women: for governor, attorney general, and district attorney. She said she had voted Republican all her life, until Barack Obama ran for office, when she switched to help elect the first black president. Now, she said, she’d like to see more women in office. “I thought it’s time the women had a say,” said Wiltshire, a retired medical technician, standing outside the polling place. Beside her, Carmelo Vazzino, 66, a retired carpenter, nodded his head. “I believe in that, too,” he said. Travis Andersen, Nestor Ramos, David Abel, Laura Crimaldi, Meghan E. Irons, Stephen Smith, Martin Finucane, Billy Baker, and Maria Sacchetti of the Globe staff contributed to this report. Correspondent Matt Rocheleau also contributed.